This weekend is a long, holiday weekend in the U.S. Monday marks Labor Day, generally a weekend in which everyone gets together with friends and family to eat, drink, and be merry knowing that they don’t have to go to work on Monday. Labor Day was started in the late 19th century by union workers and laborers as a way to recognize those that work day by day. It has been an official American holiday since 1894, always falling on the first Monday of September. This year I decided to get back to the roots of the holiday and celebrate some of my favorite activists, commending them for their dedicated work – on top of the typical barbecues and bonfires. You might just think of Jamie Oliver as a chef with a funny accent, but he’s much more than that. Jamie digs into our modern industrialized food system and delivers displeasing knowledge. (Pink slime is a prominent example.) His primary work was with school lunches in both his home U.K. and also here in the U.S. That’s noteworthy, a famous chef who champions for quite literally the little guys. Food these days has transformed into chemically-laden, pesticide-pumped, GMO, never-rotting, highly processed science of convenience. Now, do I eat processed food now and again? Yes, but I try to keep it out of my kitchen and my body as much as possible and to educate myself on nutrition and health. Do I think that America’s and the world’s children should be protected from being fed it daily in their homes and public school cafeterias? Definitely. Jamie had a reality show back in 2009 in which he embedded himself in America’s most unhealthy city, Huntington, West Virginia. He investigated what the children were in eating in their schools and it wasn’t appetizing. The rest of the series Jamie worked with schools and the community to educate them about eating fresh and healthy foods as opposed to quick and easy processed food, attempting to alter the way that food was prepared in the schools and homes in the area. Since then Jamie has spearheaded a Food Revolution, click on the link and read articles about how to be healthy and current write-ups on the food industry. Another Brit is my notable hero – Safia Minney, founder & CEO of People TreePeople Tree clothing, a U.K. based, slow fashion company. I first heard of Safia in a great documentary, The True Cost which is about the horrendous industry that is Fast Fashion. In the documentary Safia is not only inspiring because she is a female CEO, but also because she displays her fluent Japanese, which she uses when working with craftsmen and women in Japan who make pieces of art for People Tree’s clothing. Having a second language has always been inspiring to me. If you get a chance to watch the documentary I highly suggest it as it outlines the problems with the fashion industry today while at the same time giving alternatives such as People Tree. But back to Safia, she is a woman of power who promotes fair trade in an industry that generally treats it’s labor extremely poorly. People Tree not only pays attention to the way that the people creating the clothing is treated, but they also source traditionally made, artisanal materials that help keep traditional crafts alive. The company also uses organic cottons and other sustainable materials that are better for our bodies and the earth. BAPS stands for Busan Abandoned Pet Sanctuary and is a dog rescue organization in Busan, South Korea. Although BAPS has grown in the years with many expat and some Korean volunteers helping the organization, donating time and money, and fostering and adopting furry best friends; the vast majority of the work done for the completely privately run dog rescue organization is done by two people alone. They are Leo and Jin and what they do inspires me completely. Leo and Jin are a married couple, one expat one Korean, who started BAPS in 2008 and have saved the lives of hundreds of Korean street dogs and abandoned pets. We instantly fell in love with that little face with big ears the first time we walked him and he kept looking back to make sure that we were still with him. The kindest, most from-the-heart work that these two do is run a related organization called Wendy’s Last Meals. This is heartbreaking work that I am certain I would not be strong enough emotionally to do. As the name suggests, the work involved is providing a final meal to dogs at a pound in Busan whom have not been claimed or adopted and therefore face certain euthanasia. You can read more about the process and how you can help by donating by clicking here. Before the meals are given, Jin takes pics of the dogs in a last hope effort of getting them rescued, so if you’re looking to find your new partner in crime, then have a look at the beauties that are waiting for you. There is great work being done around the globe to help fight for those dis-empowered to do so for themselves such as school children, laborers working in developing nations to produce our clothing, and dogs left on mountain sides by families unwilling to continue raising them. I am so grateful for all that they do and am motivated to do my own positive work to make a difference in my community. Who are you tipping your hat to on this Labor Day weekend that works hard and inspires you? Halloween’s coming up which means that stores are full of racks of cheap, synthetic costumes (possibly to be worn only once and then disposed of the day after the party.) Holidays have become so commercialized, being more about what can be sold than about the holiday itself. Consumerism creates a lot of waste, not only the costumes & decorations themselves but also all of the plastic packaging that they come in. So this year, consider doing a DIY costume: they’re cheaper, more ethical, friendlier to the earth, and are an outlet for creativity. Here are some tips for making a DIY Halloween costume. Scope your closet. All you need is one item to begin the creative process. Once you have a defining piece, try to match something else you have with it to build upon the look. 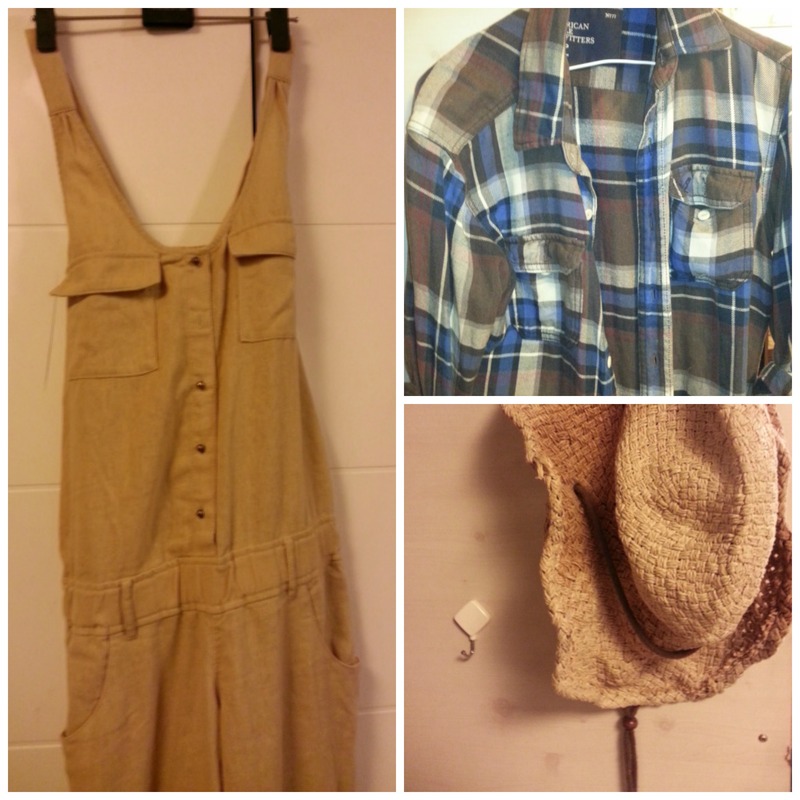 If you can’t find it in your own closet then look in your friends’ and family members’; for example overalls and your boyfriends flannel morph into a farmer or scarecrow. If all closets leave you empty handed, or you don’t want to risk staining your clothes with fake blood, then head to the thrift store. Don’t feel stuck with the way the clothes are, cut them up or alter them if you have the skills. When in doubt, Google search! You’ll find loads of images that you can get inspiration from and might even find a blog or Youtube tutorial to follow. Turn your clothes into a costume by adding face paint or accessories. Again, seek resources online. Here’s a little gallery of previous DIY costumes friends and I have done. Have fun with Halloween and be safe! What successful DIY costumes have you come up with and how are you decreasing your impact on our Earth this Halloween? 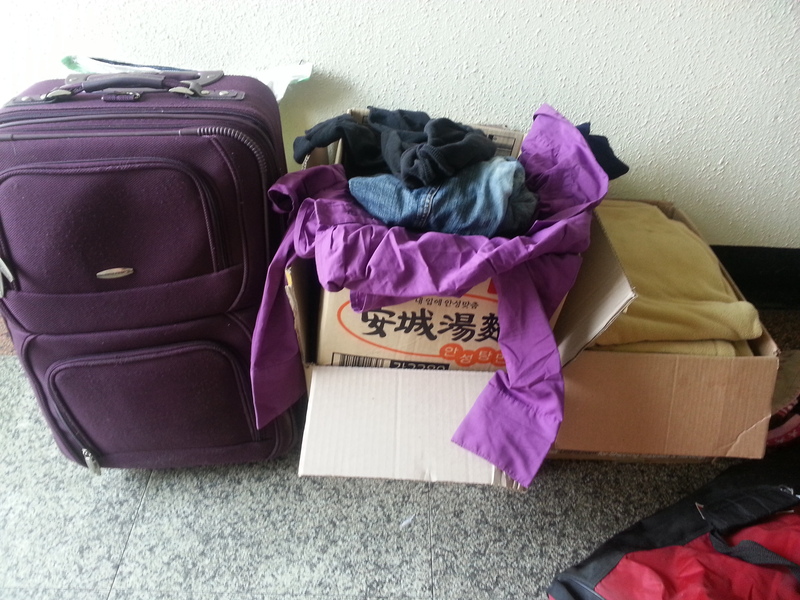 Join me in less than two weeks time, on August 29th from 2-4pm, for the third Busan clothing swap. I am excited to host this event, the past two were hugely successful, not only for those who attended, but in my eyes they were a success because they stopped people from buying fast fashion as well as kept some clothes out of landfills. Below are the details for the upcoming event. See you at the swap! Start going through your wardrobes! 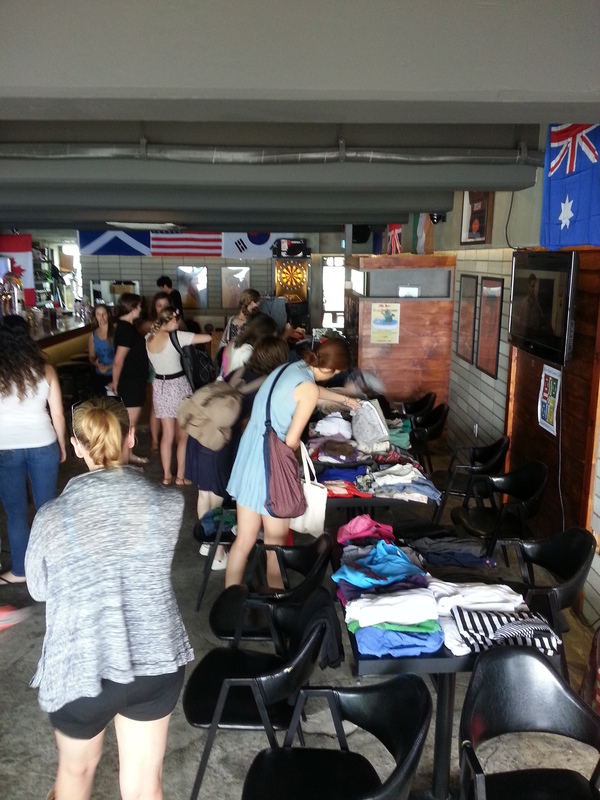 Coming Saturday, August 29th – Busan’s third clothing swap event. I’m excited to move locations to HQ Gwangan after the sad closing of Table Talk. What’s a Swap? A clothing swap is a fun gathering of people looking to get rid of their gently used, undesired items in exchange for someone else’s gently used, undesired items. There is no requirement to donate clothes (I understand that some people are new and didn’t come with much,) just come and have a search through and hopefully go home with something new. This is also a good opportunity for those leaving us to get their extra pieces to other expats or Koreans. What to Bring? **Please Read** This event is all volunteer run almost solely by myself, Kara Bemis, thankfully I have been fortunate enough to have some friends volunteer to help me on the day of the swaps to sort through clothes, with that being said- it is hard work. We must go through all the left over clothes and get them to the correct location: garbage or thrift store. Please be very selective of what to donate. Moving from a cafe to a bar, HQ and I are happy to announce that there shall be drink specials! Details to follow. Make an afternoon of it, bring some friends, grab a drink, and swap till you drop. Just as before, this is a free event with a drink purchase your entrance fee, let’s support HQ who is letting us hold the event at their waterfront spot. Take the green subway (Line 2) to Gwangan, stop 209. U-turn towards Gwangali Beach, walk straight towards the beach until you reach the main road that runs along the beach. You will be in front of Lotteria/Baskin Robins. Turn left at Lotteria and walk a few yards. HQ is on the fourth floor of the building with a chicken restaurant on the first floor and Cross Fit in the basement. If you reached Starbucks then you went too far.